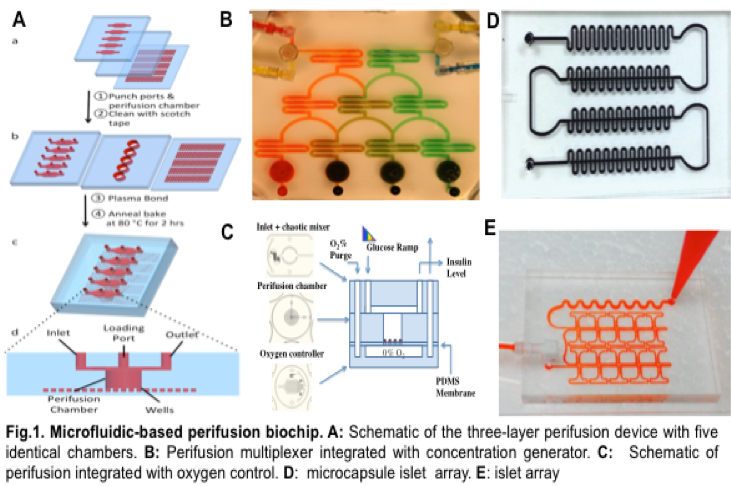 The Microfluidic-based beta-cell functional analysis facility is located in the Department of Surgery, at the University of Virginia (UVA) and is supported by the Juvenile Diabetes Research Foundation International (JDRF). Analysis and characterization service for emerging islet cell derivatives including hESCs/hiPSCs, microencapsulated islets/hESCs/hiPSCs. Screening of potential pharmaceutical agents for diabetes treatment. The analysis of hESCs/hiPSCs islet cell derivatives will be available to the JDRF researchers upon an approval by JDRF. All services provided by the Facility will be available to diabetes researchers who may not have such technology or access, based on pay for service.​ The overall purpose is to assist the field of diabetes research in moving forward with therapeutic strategies for beta-cell replacement and beta-cell regeneration to cure Type I diabetes. Additionally, we are also willing to service those who are working on islet or beta-cell related research. Compared to human islets, do the biologics have similar physiological response profiles in the presence of glucose or other secretagogues? Physiologically, what are the functional similarities and/or dissimilarities of the biologics to human islets? Does the biologics have normal or altered insulin stimulator-secretion coupling factors and what, if any, is the impact of pathophysiological changes on insulin secretion? How does microencapsulation or hypoxia impact the function and survival of microencapsulated islet cells? In the current system, islet fixation is not required. Specific chemical gradients can be established and well maintained in the perifusion chamber (Fig.2A). 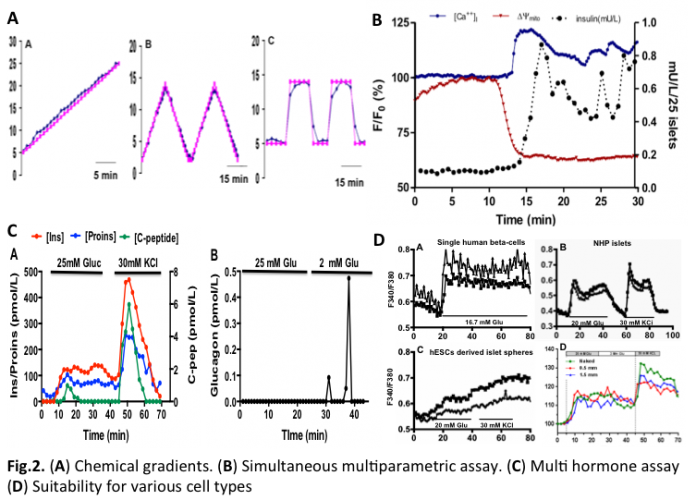 The microfluidic perifusion system measures not only insulin secretion kinetics but also insulin stimulator-secretion coupling factors by integrating with multiparametric optical imaging technology, including measurement of calcium influx, mitochondrial potentials, NAD(P)H, ROS, glucose uptake (individually or combined two or three simultaneous fluorescence imaging) (Fig2B). In addition to insulin measurements, additional islet hormones can be measured with tested spatiotemporal resolution including; proinsulin, C-peptide, and glucagon (Fig.2C). Furthermore, various islet types, single beta-cells, and encapsulated islet cells can be analyzed.